Posted on December 26, 2017 - By Fucosoft | Follow YouTube, Twitter to Get More Information. Safari is Apple’s web browser that comes built into every iPhone, iPad and iPod touch. 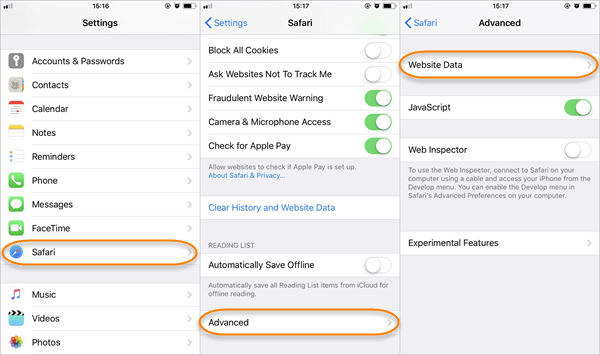 Like most modern web browsers, Safari stores your browsing history so you can call up web pages that you previously visited on your iPhone or iPad. What if you accidentally deleted or cleared your Safari history? Or lost important browsing history in Safari due to iOS 12 update or system crash? Don’t worry, you still have chances to get them back. Follow this guide to quickly find and recover deleted Safari history on iPhone XS/XS Max/XR, iPhone X, iPhone 8/7/6s/6 Plus, or iPad. To recover Safari history, you need third-party data recovery tool like Fucosoft iPhone Data Recovery. It can recover deleted Safari history on iPhone XS, iPhone XS Max, iPhone XR, iPhone X, iPhone 8/7/6s/6 Plus, or iPad Pro directly without backup. Also, it works with the latest iOS 12 and lets you recover more iOS contents like photos, videos, contacts, messages, WhatsApp, Viber, notes, etc. More than that, this program supports selectively recover data from iTunes or iCloud backup, provided you have one. Download and install Fucosoft iPhone Safari History Recovery on your computer. Run it and then choose “Recover from iOS device”. Now connect your iPhone or iPad to the computer using a USB cable and wait for the program to detect the device. After that, click “Start” to continue. In the next screen, choose “Safari Bookmars”, “Safari history” or any other data you wish to recover, then click “Scan” to begin scanning the device. When the scan is complete, you can preview all browsing history in details. Then select the items you need and click “Recover” to save deleted history to your computer. If you have included Safari history on your iCloud backup and your Safari browsing history were deleted in less than 30 days, you can try to restore Safari history from iCloud.com. Sign in to iCloud.com with your iCloud account and password. Scroll down to the “Advanced Settings” and click “Restore Bookmarks”. You can use the mini track on iPhone or iPad to find some of your deleted Safari history. Please note that if you have cleared up cookies, cache or data, you couldn’t find any data here. Head to “Settings” on your iPhone or iPad. Scroll down the screen to find “Safari” and tap on it. Scroll to the bottom, find and click on the “Advanced” option. Click on “Website Data” to find some of your deleted Safari history there.